A new plaque displayed at the Welch pool. StateCollege.com photo. A 1968 plaque, also displayed at the Welch pool. StateCollege.com photo. 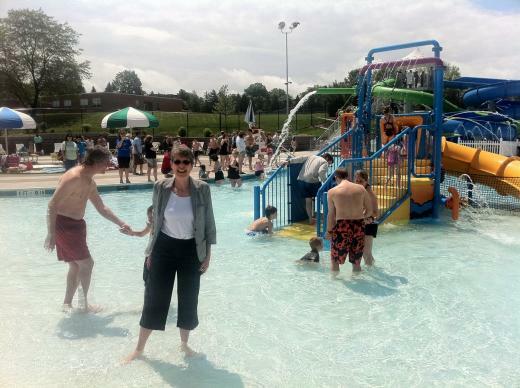 Sunny skies greeted the reopening of the pool on Saturday. StateCollege.com photo. 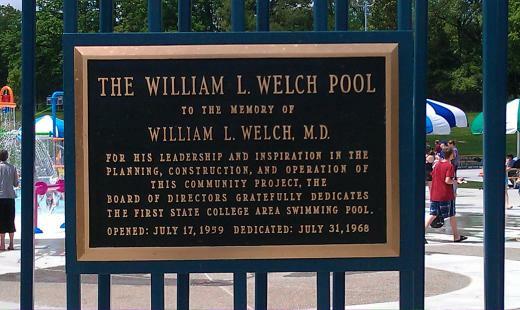 Some 52 summers ago, the late Dr. William L. Welch -- the father of late State College Mayor Bill Welch -- was first to swim in a then-new Westerly Parkway community pool, as the story goes. Indeed, it was his local vision -- his commitment, his drive -- that made possible State College's first outdoor public pool. Getting the project to fruition took six years and $350,000, money raised primarily through a community campaign that Dr. Welch helped to lead. On Saturday, two great-granddaughters he never had a chance to meet were among the first in the fully reconstructed William L. Welch Sr. Community Swimming Pool, just overhauled and expanded for $5.2 million. "I'm a big believer in history," and the idea that long-ago efforts help shape the present, said Dan Klees, chair of the Centre Region Parks Capital Committee. Speaking at the pool-rededication event, he graciously extended posthumous thanks to Dr. Welch and the original committees that planned the first Westerly Parkway pool. Ron Woodhead, too, paid tribute to the decades-deep foundation set by the community. In remarks before the Saturday-morning crowd, he noted the attendance of the Welch family and expressed gratitude to Kofman for her support. "There's no stars involved in this," said Woodhead, the director of regional parks and recreation, celebrating the "team effort" underlying such collaborative public projects in the five-municipality Centre Region. "I think community is the key," Klees reiterated. " ... Not everywhere in Pennsylvania will you find five municipalities that can collaborate" on this scale. As late Mayor Welch would say, this is still -- in some ways -- a very small town. The small-town ability to collaborate, paired with big-town -- and increasingly global -- ambition, is very much a State College thing. To borrow again from Mayor Welch: State College has evolved well because its reflexive response to opportunity has been "Yes," growing smartly without forgetting the best of its past. 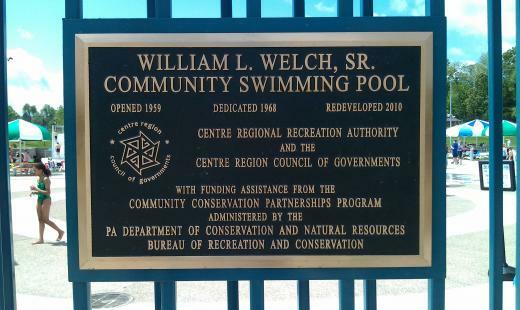 Still, nearly two years since his passing, his presence -- and that of his father -- remained very much central as the Welch pool reopened Saturday. The spirit of humble service, of selfless contributions, of a greater good and community pride is entrenched in our shared character. Tough to imagine the late members of the Welch family would be anything but proud of the new pool set-up, which includes a 120,000-gallon leisure pool, a 260,000-gallon competition pool and expanded lawn and deck areas. Crowding should be nicely alleviated in the redesigned space, whose architect -- Alan Popovich -- is local to Boalsburg. Here's to keeping those visible markers as symbols -- symbols of a past that never failed to imagine the future. Editor's Note: This report was written by Onward State and StateCollege.com's Davis Shaver, who also took the accompanying photographs. 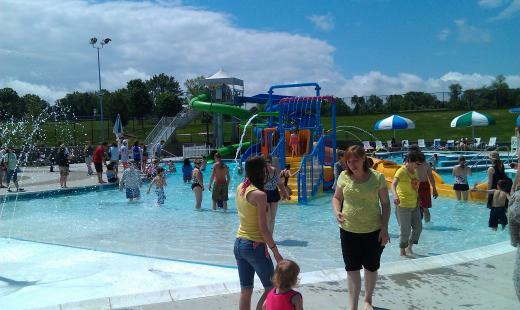 Saturday morning, the Centre Region Parks and Recreation authority opened the newly renovated William L. Welch Community Swimming Pool to the public in a "First Splash" ceremony. Disclaimer: The views and opinions of the authors expressed therein do not necessarily state or reflect those of StateCollege.com.